The weather service totally missed this one. 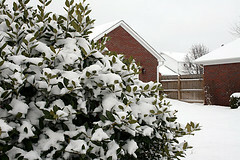 I’ve always said though that our biggest snows are not predicted. Our neighbors across the street built a snow-bathing woman. Looks like she has sun lotion but I don’t think she’s going to need it. 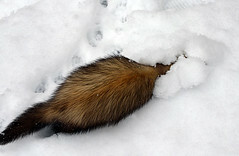 I tried to get the ferrets to play in the snow. Zoe decided she would rather sleep in. Clyde ran back into the house and hid under the couch as soon as his feet hit the snow. Then there was Dexter. Dexter took to the snow right away. 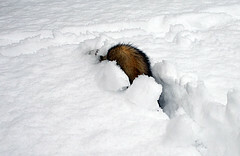 Sticking his head under the snow, he tunneled all around the yard. But then Dexter has a little more, uh, insulation than the other two ferrets.